Is your conservatory covered in stubborn green algae and dirty stains? Why not bring your conservatory back to life, making it a garden/house feature to enjoy once again. Using our specialist equipment, we can bring back the colour and condition of your tired looking conservatory. 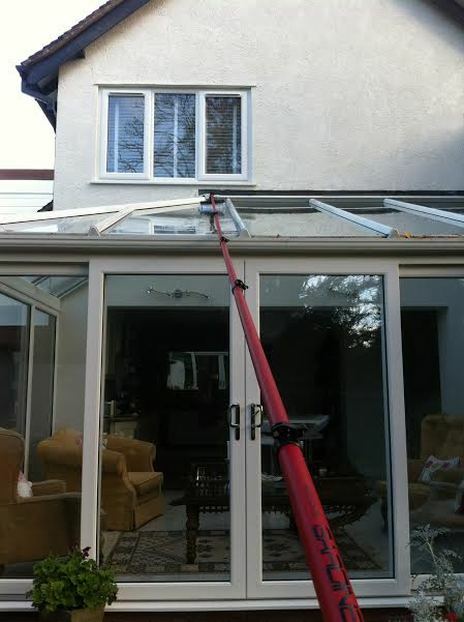 We use a water fed extension pole and purified water which allows the glass and uPVC to dry leaving no water marks or smears leaving your conservatory gleaming. Along with cleaning all the roof, roof cresting, window frames, doors and frames we also make sure all of your conservatory's guttering is cleared and flowing correctly. Every conservatory cleaned by our team is cleaned 90% by hand so we know that every little nook and cranny has been cleaned meaning the end results are second to none and all of our customers can not wait to show and tell their friends and family all about their freshly cleaned conservatory. Our attention to detail is one of the reasons we have a 5 star rating and many returning customers. We love what we do and because of this, we get great gratification at the end of every job.